This “superb, thought-provoking” ethnographic documentary explores the vitality and controversies surrounding a remarkable syncretic religious ceremony held in neighboring remote villages in rural Honduras during the Easter Holy Week. The ritual drama enacted in this ceremony resonates with persistent indigenous beliefs although expressed within a familiar Catholic framework. During the week leading up to Semana Santa, the two villages are literally overrun by characters called “Judios” (Spanish for “Jews”), masked individuals who carry wooden swords, speak in a strange guttural manner, and generally cause mayhem by staging riotous mock sword fights. Not surprisingly, members of the local Catholic Church – most notably the parish priest – consider these indigenous celebrations to be sacrilegious and want them ended. Tensions between Church members and the celebration participants are high, and the conflict is further exacerbated because the opposing sides are not comfortable speaking directly to one another about the issues involved. However, by including the divergent perspectives of members of the various constituencies, one of the principal goals of the film itself is to facilitate a channel of communication between the opposing parties that will enable dialogue to take place between them. With that goal in mind, the filmmaker returned to Honduras to screen a preliminary version of the film in order to make this invaluable cultural heritage available to the very community to which it belongs. 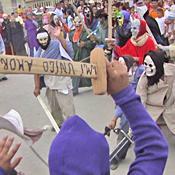 Community members with opposing views were asked for their reactions, which were then incorporated into a final version of Celebrating Semana Santa, thereby adding a unique reflexive component to the film. Celebrating Semana Santa powerfully illustrates how symbols from the past may be re-interpreted in modern contexts and not simply survive but thrive in those radically changed situations. In so doing the film illuminates the varied ways that people craft their understanding of the present with reference to the past and their hopes for the future. The film will engage students and inspire thought and discussion in a wide variety of courses in Latin American studies, cultural anthropology and ethnography, and religious studies. It was produced and directed by Sam Pack, Associate Professor of Cultural Anthropology at Kenyon College. It is in Spanish with English subtitles.